At your choice are different pens, for example, gel, watercolor, pencil, etc. You can save your viewed and important documents in bookmarks so that you can return to them at any time. Also, you have the opportunity to make a small presentation or video from your documents. Magnification window allows you to write into a zoomed in view whilst still viewing the zoomed out view. This feature is very convenient for gadgets with a small screen. Creating subpages allows you to use sticky-notes or create hierarchical files. To create subpages, you can also use files in PDF format. For easy viewing and writing, use the function of unlimited zoom, as well as the screen rotation. 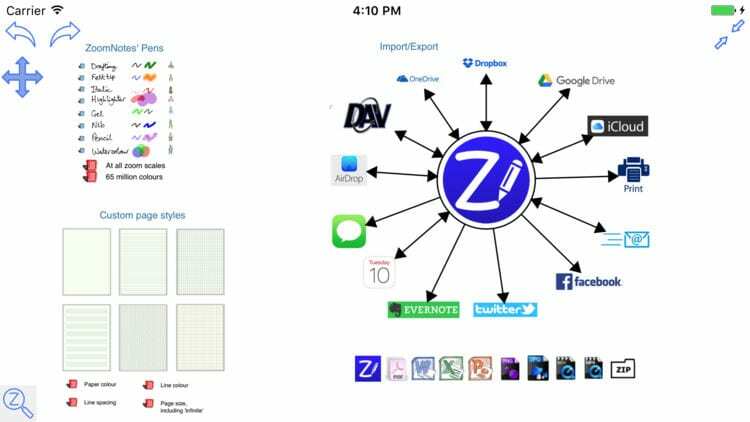 Move and rotate objects, cutout, copy, paste – all this and not only you can do in the ZoomNotes application. The operation with such formats as PDF, MS Doc, PPT is supported. If you have a rich imagination and a simple black color bored you, then create your own using 65 million finished color palette. For more visualization, use the tool to draw lines and geometric shapes. The application contains an extensive library of reusable shapes and images. Add them to your collection and use them in your entries. If you need one, you can insert an image of any size and scale into the document. Editable elements such as cropping, masking, resampling and others are available. Use both your gallery and the pictures taken on the camera at the moment. It is possible to add web pages to a document. In the application, you will find a wide range of fonts, their size, color, fill, and borders. Move, scale, flip the text as you like with respect to all drawing elements. 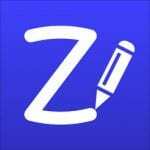 The ZoomNotes application is your ideal assistant in the presentation process. It is compatible with VGA, so you can connect your gadget to any presenter and monitor. As you could already guess, the ZoomNotes application has a rich functionality. In addition to the above features, the program has other peculiarities, such as selecting the type and style of paper, scanning documents, the ability to export and import caf files, recording, and playback of sounds, electronic stylus support, and much more. This tool is ideal for students, businessmen and just people who are used to writing down everything important in a notebook. And ZoomNotes is not just a notebook but a treasure of various functions that will make your life easier!